Talk is one of the most powerful tools at work in my classroom. Now, I’m talking about talk—not discussion, sharing, peer editing, Socratic seminars, think-pair-share, or any other structured form of communication that might occur. The simple act of letting our students just talk is invaluable, and we must create spaces in our curriculum for it to take place. Here are three ways I encourage talk in my classroom. Conferences – Reading and writing conferences aren’t just about assessment. They’re also a valuable time for teachers and students to just talk to one another, getting to know each other as the humans that we are. Creating a space for talk breaks down the teacher-student barrier, humanizes both parties, and by and large erases discipline problems in my classroom. I begin every conference with a simple, “How are you today?”, and after genuinely listening for the child’s answer, direct the conference from there. Some conferences, we don’t talk about books or writing–we just talk, because the student needs to. 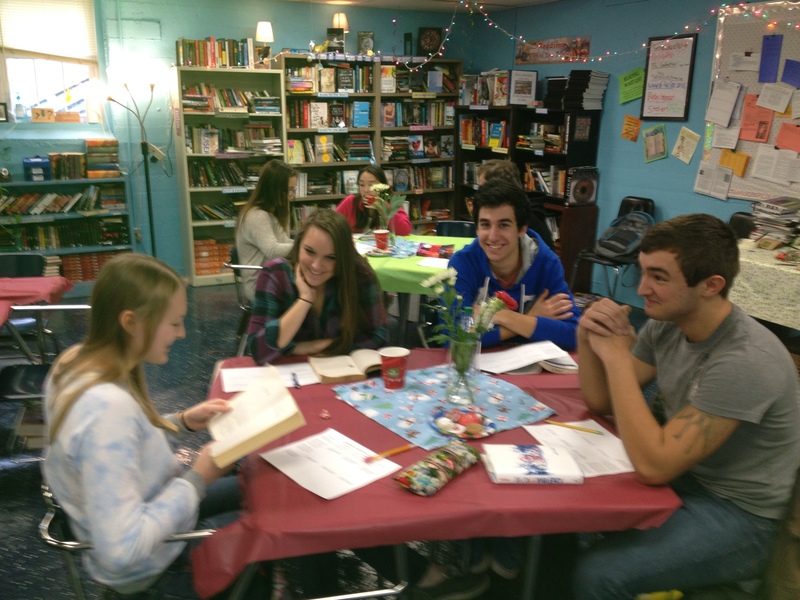 Book Clubs – Not every book club meeting requires structure or an agenda to be valuable. During this most recent unit, I simply asked students to keep the conversation going for 20 straight minutes. They sometimes had to cast about for topics, but they always found something to discuss–mostly their books, but often text-to-text/self/world connections they’d made, which spun off into generalized, real-life conversations between kids who wouldn’t ordinarily find themselves chatting. After finishing book clubs, Ana wrote, “I loved our book clubs because I felt like I got to know everyone better.” She wrote other things about how she grew as a reader and writer…but she LOVED the unit because of the TALK that happened. Root of the Writing Process – My journalism students consistently talk out their ideas at the very beginning of the writing process. They chat in groups, usually starting with, “so what should I write about?” It takes a few minutes, but enlightenment inevitably follows–the other day, Shay threw a few silly ideas out for Kenleigh about bathroom graffiti, but then they got serious about that as a story idea. “You could call your piece ‘Signs from the Stalls,'” Shay said. “AHHHH, that’s a great idea! !” Kenleigh enthused. What kids like to talk about is often what they’d like to write about, and they need to talk to get to the heart of those topic ideas. How do you see talk improving your classroom and its community? What spaces do you create for talk in your classes? I love this idea, and have tried it ….sort of. I just don’t have enough time in my class period to have good discussions with all of the students. How much time do you all have per class? WE only have 47 minutes. Hi Mindy! I’m fortunate enough to have 90 minutes with my students, but only every other day. We have to have rousing, memorable talk so the ideas carry over! I think if you can allow the last 20 or so minutes of class 2-3 times per week for talk of some kind–structured discussion, Socratic seminars, think pair share, conferencing–or just chatter about reading and writing, your students and you will benefit. They could write with your guidance the other 2-3 days, and get lots of reading done at home. Good luck! Thanks for joining the conversation! Yes, talk is at the core. Reading is essentially talking with an author while writing always begins with talk. However, I would argue that all talk beyond baby babbling has a social purpose and structure. Your classroom talking may be different from talk in other classrooms but it also has it rules, rituals and boundaries. I have always thought the largest problem with US schooling is the pre-demonance of teacher talk, so focusing on student talk is major. Still, I think we should consider what would be the best balance between between teacher and student talk. As the literacy expert in the classroom, I think the reading/language arts teacher’s voice needs to be heard often. While we all can be our own teachers, we will probably learn more with the wise guidance of a teacher. Yes! Well said as always, Alan. Talk, one of those seemingly simple activities of everyday life, that is sadly missing as we text. I’ve always thought it so strange that we spend so much time teaching our little ones to talk and then we spend nearly the rest of their school careers getting to be silent! We get to know each other through our stories. Ruth, I love that–we get to know each other through stories. Tom Newkirk would love that line!! This is quickly becoming my new favorite blog. Yay! We’re so glad you’ve joined our conversation, Trisha.